In three seasons, Lions head coach Jim Schwartz has taken an 0-16 team to the playoffs with a 10-6 record and a nucleus of young players being developed. It's a no-brainer for the Lions to extend his contract before the start of next season. I fully expect them to do so. 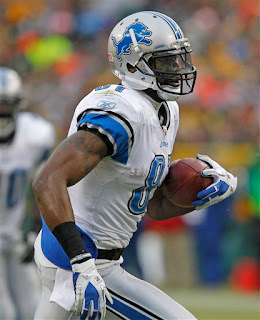 Same with wide receiver Calvin Johnson. They need to spread out the salary cap hit on his contract sooner instead of later. Nobody wants to get to the franchise tag point, especially since it would be so costly for just one season (reportedly $26 million). Trading Johnson makes no sense. What would the Lions be hoping to get - another Calvin Johnson? People who focused on getting draft picks for Johnson don't understand the league is based on truly great players. Get a couple of them on a team - and it is much easier to build. Don't see a trade happening. This is not Roy Williams. Johnson is that special of a player. And why would he want to leave? His chances for success have gone up immensely because of Matthew Stafford. The only potential fly in the ointment would be an agent who is unreasonable. I don't see the Lions being hardliners here. They'll pay Johnson and Schwartz very well. The decision isn't going to be that difficult on Cliff Avril, either. He is an excellent player - the Lions defensive MVP this season. But unlike Johnson, he is not an irreplaceable player. Offer him fair market value, maybe a little more, but if some team overpays for Avril, then the Lions would be wise to let him go as a free agent. The Lions are screwed in having to pay top dollar to Johnson, STAFFORD and Suh. (This is the lingering effect of the Millen Error, er, Era) There won't be much $ left to spend on other talent after they are all re-signed. If the Lions pay all three, then we are stuck with what we saw this year. A decent team, but one that won't go anywhere in the playoffs. I say trade Suh if you can get a couple of mid first round picks and a decent defender or O Lineman. Don't overpay for Calvin. He may be the best at his position, but you can't break the bank to keep him. If he moves on elsewhere, so be it. (Good luck getting what the Lions are paying you now Cal.) Then we will have $25-35 million a year to spend on DB's that can cover, and other defensive players that actually know how to tackle. you have to sign and keep Calvin and Stafford forever. this is the team, everything else you fill in around them the best you can manage. if you do a good job and are a little lucky, you can build a super bowl team, or ay least a serious contender for years around this nucleus. the lions are very close, a team doesn't have to be perfect to win the super bowl. green bay and NO are far from perfect. Lions probably need far less moves, and far less dramatic moves than most people think to be a real threat to win the super bowl next season. personally i think the lions GM and coaching staff gets it. trading or not signing either one of these two will guarantee you one thing: of creating a new sports curse, and you will go down in infamy in Detroit sports history. guys we got lucky when we got Calvin dn Stafford and they became what we hoped. we had to suffer a long long time, and our forefathers before us too. we aren't going to throw that away now. we are going to do the right thing.